Trainieren Sie, um ein Agent der Marvel’s Avengers S.T.A.T.I.O.N. (Wissenschaftliches Training und taktisches Geheimdienstnetz) im Treasure Island in Las Vegas zu werden. Dieses unterhaltsame und informative Erlebnis vereint Besucher mit der Welt der Avengers. Genießen Sie Zugang zu einer Fülle von Intelligenz-Dateien, klassifizierten Studien und Experimenten, erkunden Sie die Geschichte und den Ursprung der Avengers. Sehen Sie die Uniform und das Schild von Captain America und das Labor von Bruce Banner. Schauen Sie sich die Sterne auf der Karte an, um Asgard und die Schlacht von Ultron zu finden. Außerdem erfahren Sie, wie man den Anzug von Iron Man bedient und vieles mehr. Rated 5/5 by 11 year old Marvel fan! Even my 14 year old and I enjoyed it. Was great to have interactive things in each section - well thought out and done. A must for Marvel fans! It was definitely a fun experience my boyfriend and I are marvel fanatics. We also got a private tour so it was nice. I just wish it was longer. Technical issues meant we couldnt do it on our chosen day but they honoured the tickets the following day. My handheld device, which is an essential part of the experience, ran out of battery a couple of rooms in so I had to find an employee to ask for a replacement which took the gloss off the experience for me. The marvel tour was really good. My partner who is a massive marvel fan really enjoyed himself so I'm glad I booked it as a surprise for him. It's worth doing if you are a Marvel's fan. This was a really interactive exhibit. While I honestly haven't seen many Marvels movies, I definitely want to and come back to experience this again! There are real props from the movies, information on each character and helpful staff that help you at each interactive exhibit. I went through Avengers Station and found it to be really interesting. There are props from the movies and some replicas, but also a lot of fun things to do as well. I would highly recommend this to any fan of the Avengers movies, and even of you're not - it's still truly a fun way to spend a few hours! This takes about an hour. 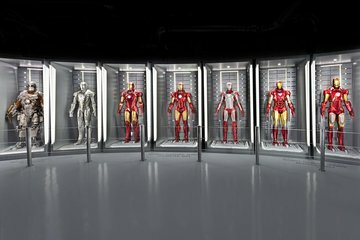 If you are a Marvel fan, this is a great experience. Search for discount tickets rather than directly through the hotel. It was not crowded but the tech issues slow the progress and could be improved.